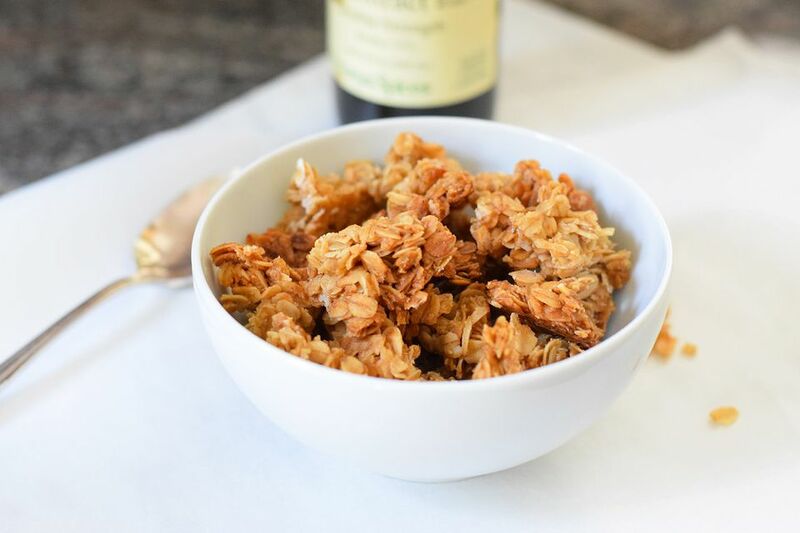 Crockpot Vanilla Almond Granola is full of sweet honey, fragrant vanilla, and crunchy almonds. It's only a few ingredients and is ready to eat in about 2 hours! The best part about it is that it's made right in the crockpot and requires almost no clean up! No one likes cleaning the bulky interior of a crockpot, and with this recipe you don't have to! Simply line the crockpot with parchment paper, dump the granola inside and when it's done just lift it out by the edges of the parchment! Then put your crockpot away! It could not be easier! This granola breaks up into nice, large chunks that are perfect for topping on yogurt, ice cream, or eating on its own! no more homemade granola that are just sugary loose oats! Add whatever else you want to this granola! Use this recipe as a super versatile base! Try adding other nuts, dried fruits, or dark or milk chocolate. If you are adding chocolate (you can use chips or chunks! ), just make sure to wait until the butter mixture has cooled on the oats before adding them! Or drizzle some chocolate over the top of the granola after it has cooled! You can also try adding spices like cinnamon! Place 2 cups of the oats in a large bowl, blend the remaining 1/2 cup in a food processor to make a flour. Add the slivered almonds, oat flour, regular flour, and baking powder to the oats. Mix until completely combined. In a small saucepan or in a microwave safe dish combine the butter, honey, and brown sugar. Heat on the stove or in the microwave until the butter has melted and the sugar has dissolved. Add vanilla to the mixture and stir until mixed completely. Pour the sugar mixture over the oat mixture and stir to completely combine. Place a piece of parchment paper in the bottom of your crockpot so that it completely covers the bottom and a good part of each side. Spread the oats onto the parchment paper. Heat the crockpot covered on high for two hours. Carefully remove the parchment paper from the crockpot. Allow it to cool and then break apart the granola into desired sized chunks. Store the granola in an airtight container or serve immediately.